Run either one or two gels simultaneously on these versatile vertical separation systems from High Desert Bioscience. 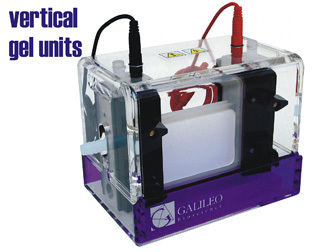 Choose from four sizes of Galileo Refection™ twin gel vertical electrophoresis devices. These Galileo Reflection™ vertical units all feature a cast in place sytem for quick, tape-free gel casting. The gel sandwich of glass and spacers is attached to the upper buffer chamber in the normal gel run position. The upper buffer chmber is then placed on a gasketed casting base to seal the lower edges of the gel. Gels are then poured as norma, and after the gels have polymerized, the completed gels and upper buffer chamber are transferred to the lower buffer chamber for running.